Want to know more about us? Find out how we can help you provide world-class, multi-channel experiences that enhance your brand, deliver maximum satisfaction and create greater profitability. 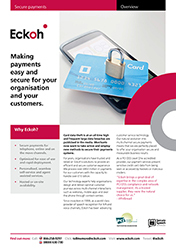 We process over £600 million annually in payments for our customers. 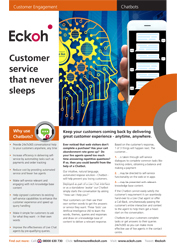 For years, organisations have trusted and relied upon Eckoh's solutions to provide an efficient and secure customer experience. 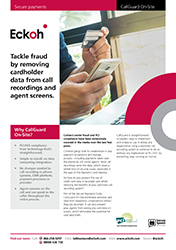 Tackle fraud by removing cardholder data from call recordings and agents. 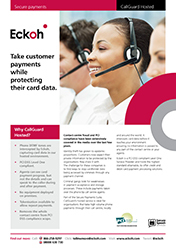 CallGuard eliminates sensitive card data from telephone conversations before they are recorded. It will prevent your agents from seeing any card data on screen, which eliminates the potential for card data theft. 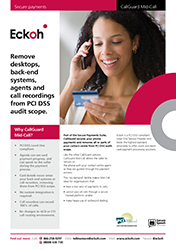 Remove desktops, back-end systems, agents and call recordings from PCI DSS audit scope. 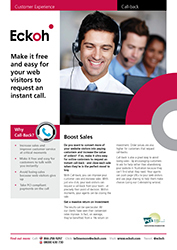 It differs from our Hosted solution as it does not need all calls to be routed through the hosted platform. Instead, the secure service can be activated on an 'on demand' basis, as and when a payment occurs during a call. CallGuard's hosted service is ideal for organisations that take high volume phone payments through their call centre, locally and around the world. CallGuard Hosted intercepts card data at a network level, ensuring no information is passed to any part of the contact centre or your agents. Remove your entire contact centre from scope, with an audio tokenisation solution that requires absolutely no integration with existing systems of process. 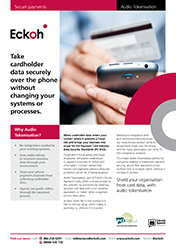 The flexibility of Audio Tokenisation makes it an ideal payment solution for BPO's representing multiple clients, or organisations with multi-site contact centres. 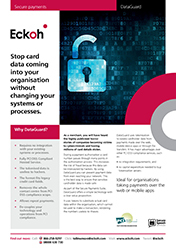 Stop card data coming into your organisation without changing your systems or processes. DataGuard uses tokenisation to isolate cardholder data from payments made over the web, mobile device apps or through file transfers. 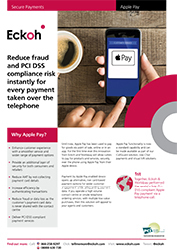 Beat fraud and increase customer choice and convenience with payment automation through our secure, multi-channel self-service payment system. With customers demanding more ways to self-serve, customer service departments need to add new ways of paying securely over multiple channels, without risk of fraud. 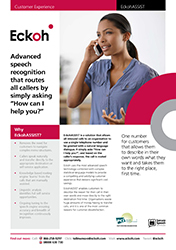 Improve customer experience and reduce call waiting times with this dynamic solution, which incorporates advanced speech recognition that routes all callers by simply asking "How can I help you?" 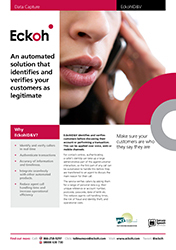 Identify customers over multiple channels and increase effiency with this automated solution which verifies your callers as legitimate. 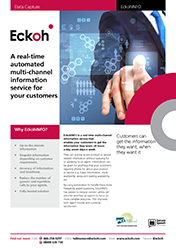 A real-time automated multi-channel information service for your customers, EckohINFO means information can be accessed by your customers 24/7 across phone, web and mobile channels. 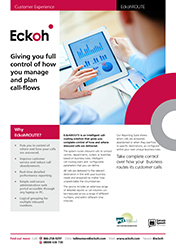 An intelligent call-routing solution enabling you with full control to manage and plan your call-flows at any time. 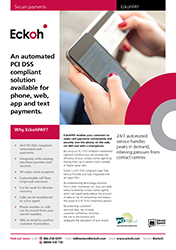 EckohROUTE is easy to administer and allows for immediate changes. How can you communicate easily to thousands of customers with important offers, confirmations, surveys and more? 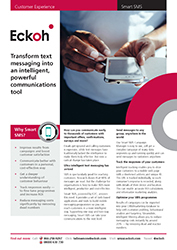 Transform text messaging into an intelligent, powerful communications tool. Web visitors can often get stuck, confused or become uncertain — preventing them from clicking 'Order'. But offering to hold their hands on-screen can make all the difference, turning disappointment and missed opportunities into solid sales and a positive customer experience. Do you want to convert more of your website visitors into paying customers and increase the value of orders? If so, make it ultra easy for online customers to request an instant call-back - and close each sale when they're in the perfect mood to buy. Do you want to offer personal help to multiple online customers at the same time in a cost-effective way? 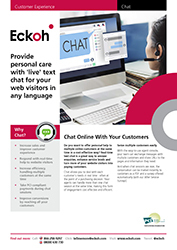 Real-time Web Chat is a great way to answer enquiries, enhance service levels and turn more of your website visitors into paying customers. 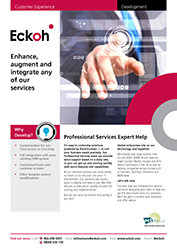 It's easy to customise solutions powered by Klick2Contact — to suit your business needs precisely. Our Professional Services team can provide extra support based on a daily rate, so you can get up and running quickly with extra features and capabilities. Do you want to make sure you never miss another customer email? 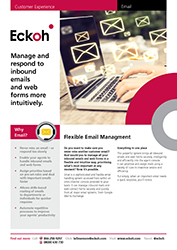 And would you to manage all your inbound emails and web forms in a flexible and intuitive way, prioritising what's most important at any moment? Now it's possible. 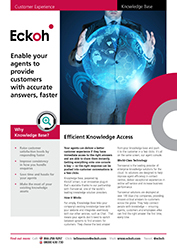 Your agents can deliver a better customer experience if they have immediate access to the right answers and are able to share them instantly. Getting everything onto one console is key — so the right response can be pushed into customer conversations in a few clicks. 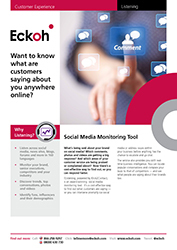 What's being said about your brand on social media? Which comments, photos and videos are getting a big response? And which areas of your customer service are being praised or complained about? 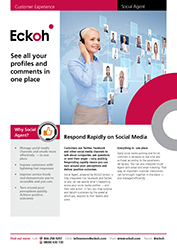 Now there's a cost-effective way to find out, so you can respond faster. Customers use Twitter, Facebook and other social media channels to talk about companies, ask questions or vent their anger —very publicly. Responding rapidly means you can turn around poor perceptions and deliver positive outcomes. 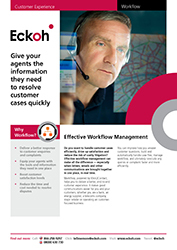 Do you want to handle customer cases efficiently, drive up satisfaction and reduce the risk of costly litigation? Effective workflow management can make all the difference — especially when letters, emails and other communications are brought together in one place, in real time. 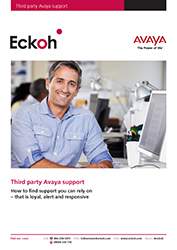 Has the manufacturer for the system your business is using, just stopped providing support? It doesn't mean end of live. 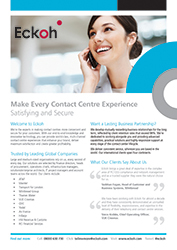 Eckoh are experts in supporting legacy contact centre technology, providing you with a third party support solution. 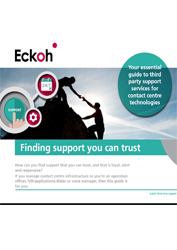 Have you made the decision to switch to new contact centre technology? Perhaps your new solution will be sited on premise, hosted remotely, or you’re merging systems? Ensure your old infrastructure runs smoothly and cost-effectively with the Bridging the Gap Guide. Decommissioning can be costly, time-consuming and inconvenient. It can interfere with “business as usual” activities, and even delay new projects. There are regulations to be considered for health and safety risks, environmental legislation, and other complexities. 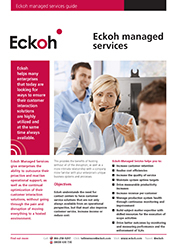 Eckoh is able to assist with the shut-down, removal and disposal of a wide range of technologies. 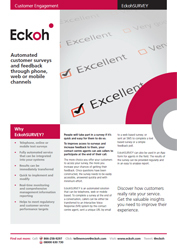 Are you looking for ways to ensure your customer interaction solutions are improving, utilised and always available? You can do all of that, by simply outsourcing to us - without going through the pain and disruption of moving everything to a hosted environment. 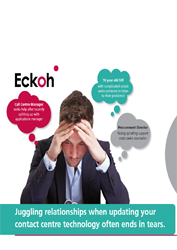 Are you facing, or putting off the daunting decision of how and when to upgrade your contact centre technology? This guide explores the issues and looks at viable choices that avoid the disruption, costs and risks of doing nothing – or the wrong thing. Our CallGuard solution effectively puts a shield around all or part of your contact centre, stopping card data from infiltrating it. CallGuard is extremely flexible and is able to fit in seamlessly to complement your existing PCI DSS compliance, fraud risk and security measures. You choose how you want it. 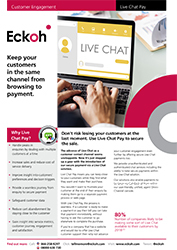 EckohSURVEY is an automated solution that can be telephone, web or mobile based.To improve access to surveys and increase feedback to them, your contact centre agents can ask callers to participate at the end of their call. The more choice you offer your customers to access your survey, the more you increase your chances of getting their feedback. Now your customers can pay over the phone using Apple Pay – for the first time. 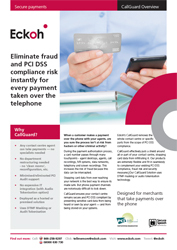 Reduce fraud and PCI DSS compliance risk instantly with every payment taken over the phone. Don’t risk losing your customers at the last moment. 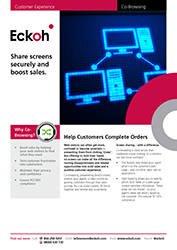 Using ChatGuard you can keep your customers in the same channel - from browsing to payment. 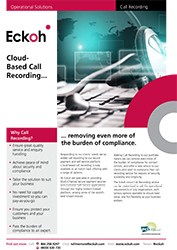 Cloud-based call recording is now part of Eckoh’s SaaS offering, helping to remove even more of the burden of PCI DSS compliance. Never lose another customer with anytime, anywhere service. Chatbots provide a 24x7x365 solution to make better use of an agents time.